Layers of colour begin to become placed over a series of flat colour. Transcending the ‘moment’, to a point when the artist is free from reality, and heading toward the ‘external’. Raymond Henshaw is interested in using linear stencils of colour to over-lap and get the image optically moving, then respond to what’s being generated on the page. Layers of colour begin to become placed automatically, moving the work to beyond transcending the ‘moment’, to a point when the artist is free from reality, and heading toward the ‘external’. 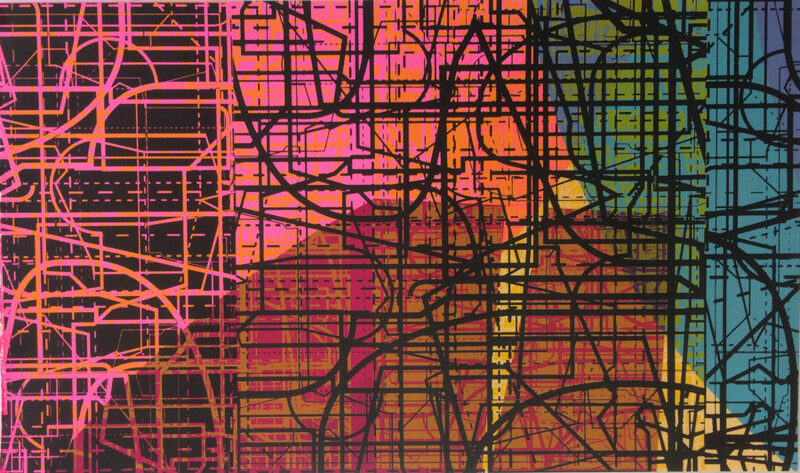 A viewer can come to observe the print, finding spatial elements that have an ‘open’ narrative, applicable to various constructs, associations with consciousness, tensions, splits and separations. Henshaw’s work also has thoughts on social politics. There are varying transcripts appearing in his photographs that one can follow, notes on communities experiential background, dialogues can be initiated including multiple layers of anthropology. Raymond Henshaw is also a curator. Recent projects include Watershed – featuring ten artists from Ireland and Hong Kong. He also recently set up the Strule Print Workshop, in Omagh. Exhibitions in Ireland, Europe, Africa, China and USA. Fenderesky Gallery, Old Museum, Queens University (Belfast), Project Arts Centre, Original Print Gallery (Dublin), Ithaca, New York State, Bag Factory (Johannesburg), University of Cape Town and Free State University Bloemfontein (South Africa), In Cite Des Arte (Paris), Hong Kong Visual Arts Centre, Barcelona, and Berlin.